The results of this week's election in Quebec leave the residents of that province -- and, indeed, the whole country -- in an intriguing connundrum: What happens when three men are riding the same horse and one man wants to turn right, another wants to turn left and the third -- presumably -- wants to go straight ahead? The theory of minority government says that all three will have to meet, compromise and find a way forward. However, because Quebec has not had a minority government in over a hundred and twenty-five years, putting the theory into practice -- something which is always hard to do -- may be particularly difficult. There are those who rejoice in the rise of Mario Dumont and the Action democratique party. And it is finally encouraging to see that the official debate is no longer between two mutually exclusive alternatives -- federalism and separatism, or as the Parti Quebecois would prefer, sovereignty. However, the political landscape defies such simplistic analysis. After all, M. Dumont says that he is in favour of an "autonomous" Quebec; and nobody, including M. Dumont, seems to be quite sure what that means. A more realistic assessment of Monday's election results is that Quebecers looked at at the Parti Liberal and the Parti Quebecois and said, "a pox on both your houses." And, because they had a third alternative, they decided to park their votes with M. Dumont -- for now. All political choices are "for now." But it is worth remembering that axiom, particularly when dealing with la belle province. One should not, for instance, come to the conclusion that separatism is dead. It may lie dormant; but it never dies. Sovereignty can be revived from anywhere on the political continuum. Rene Leveque espoused it after spending many years on the political left. 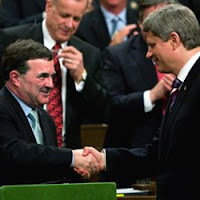 Lucien Bouchard came at sovereignty from the political right. What is required to ignite the fires of sovereignty is not a liberal or a conservative bias. What fans its flames is a heightened sense of injury, articulated by a man or woman of common origins, who can remind French speaking Quebecers (we sometimes forget that there has always been a significant minority of English speaking Quebecers) of many wrong headed decisions, from the hanging of Louis Riel, through the Conscription Crisis of World War I, to the economic divide which resulted in the Two Solitudes. And, while such common folk can rise to positions of influence among Quebec's elite, someone who has been born into that elite cannot hope to argue successfully for separatism. Jacques Pariseau was a committed separatist. But he always looked and sounded -- even in French -- like a British banker, bemoaning his lost privilege. Quebecers looked at Rene Leveque and saw the kid who fought with les anglais in the streets of small town Gaspe; and when they heard Lucien Bouchard, they heard the outsider from the Saguenay. Even more importantly, separatism needs a perceived slight to nous autres to gather steam. After all, for Quebecers, it was the bigoted English who hanged Riel; it was the English Imperialists who forced young Quebecers into a war which they did not think of as their own; and it was the rich English captains of industry who kept French Canadians working in the factories of St. Henri or on the farms of les habitants. And that brings us to the three billion dollars which Stephen Harper pitched into the Quebec stable to feed the horse which now has three jockeys. Harper bet on M. Charest to win; but he wound up with no real winner -- just two places and one show. Because the ADQ articulates essentially conservative -- with a small c -- policies, and because M. Charest is a committed federalist, there are some who claim that Mr. Harper is sitting in the cat bird seat and should call an election. However, Mr. Harper's transparent support of M. Charest (who immediately promised Quebecers that he would use a significant proportion of that money -- $700 million -- for tax breaks) may, indeed, cause a backlash in English Canada. Couple that with Mr. Harper's support for the idea that "Quebec is a nation within Canada" and his determination to shrink the influence of the federal government, yielding more control to the provinces, and you have the makings of a potential crisis. Pierre Trudeau, who came from the same background as Jacques Pariseau, knew that it was a mistake for the Prime Minister to serve as "headwaiter to the provinces." And, even though he could be guilty of the same Olympian hauteur as Pariseau, he knew how to adopt the patois of the common man, in both French and English. Clearly, Harper lacks Trudeau's vision and his ability to talk to a wide spectrum of Canadians. We can all hope that there is no October Crisis in our future and that the three men on the horse arrive at some accommodation with each other. For through it all -- the death of Riel, the Conscription Crisis and the October Crisis -- we have, so far, found a path to the future and, in Abraham Lincoln's words, "the better angels of our nature." The next few years will require that, when we make political decisions, we insist that our leaders -- and we -- consult our better angels. The Harper government's budget surprised just about everyone -- not the least of whom were those who think of themselves as conservatives. Writing in The National Post, Andrew Coyne claims that he and his confreres have been conned. "In less than two years of this 'conservative' government, spending has climbed a historic $25 billion. Bear in mind: that's on top of the wild rise in spending during the Liberals' last term. The Tories have taken all of that fat, all of that waste and all of those hundreds of priorities -- and added to them." Writing in The Globe and Mail, John Ibbitson declares that this is "a budget so Liberal, the Grits should sue." But, as usual, Jeffrey Simpson, also writing in The Globe, sees through the spin and knows to whom Harper is pitching. "The Harper Party [Simpson has not referred to them as conservatives for some time now] is not for everyone. It targets perhaps 40 percent of the electorate. It isn't interested in the regular CBC listeners and watchers, self defined urban elites, most media commentators, whining interest groups, Suzukians, big business, civil servants, or anyone keenly interested in foreign affairs." No, their target audience consists of farmers, retirees, "middle income families living in suburban or exurban areas" and Quebec nationalists "who don't want secession or who might want secession but not now." It is a narrow and inherently unstable coalition. Simpson is not the only commentator to define Harper's people as roughly 40 percent of the population. Writing in The Toronto Star, Armine Yalnizyan (whose report was the centerpiece of my post of March 7th) puts that number in a different context. She reminds her readers that, "Most Canadian tax filers --59 percent -- report incomes of less than $30,000." That means that, "Most of them will not be eligible for this budget's billions in tax credits." For, besides the financial transfers to the provinces, there were no tax cuts in this budget. Instead, the Harper government offered Canadians tax credits. And, those 59 percent of Canadians pay no taxes. Thus, tax credits do nothing for them. The only people in this category who benefit at all from this budget are individuals who earn between $3000 and $9000 or families who earn up to $14,500 a year. For them the government offers a $500 benefit -- if they are working. In other words, the working poor will get an extra $1.37 a day. 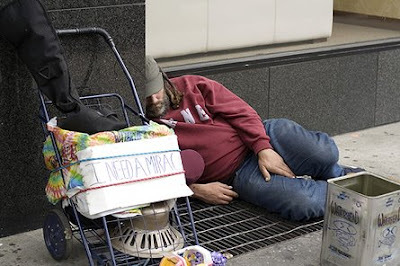 Yalnizyan writes, "This budget may be celebrated as a masterful spin document, but in terms of substance, its biggest failure is that it refuses to address, head on, one of the most pressing issues of our era: growing inequities in an era of incredible affluence." The Harper government is spending liberally; but, despite the cries of betrayal on the right, they are no liberals. Their policies are aimed at a distinct minority of Canadians. But there may be just enough of them to vote for a Conservative majority -- and that is the purpose of the exercise. However, Harper's rather transparent strategy could backfire. Jeffrey Simpson has a much better sense of history than the Harperites do. "Every time in Canadian political history that the Conservative Party tried to woo these voters, the effort eventually ended in heartbreak. Either it produced a backlash elsewhere in Canada and/or the nationalists were never very interested in Canada, except as the milch cow for money. And, of course, once the milch cow stopped giving at the expected rate, even for a while, resentment grew in Quebec." This time the resentment is starting on native reserves. Canada's native people have watched as Mr Harper and his team have torn up the Kelowna Accord and then left them out of the money. It is striking how many Conservatives -- in many countries -- lack a sense of history. They believe in that old adage that God helps those who help themselves. But, while God in his mercy may smile upon the helpless, it is not the job of government to do so. Inevitably, those who have been left out -- a distinct majority -- will storm the fortress of the fortunate. Then we will all pay a price for such wilful ignorance. My wife, our youngest son and I spent the weekend at the Ontario Speedskating Association's Short Track Provincial Championships in Ottawa. For parents of young competitors, it can be a somewhat gruelling two days. I do not refer to the skating. It's just the getting there and the long days at the rink that are a little onerous. But, after all, this is Canada; and you can walk into any rink in any town on any weekend in this country and there will be at least twelve brave souls there playing hockey. It may be three o'clock in the morning and the seats may be empty; but someone is on the ice. What matters is what happens on the ice. And, at the risk of being pilloried for treason, I here state unequivocally that speedskating should be Canada's National Sport. I did not always feel thus. When I was a kid, and there were only six teams in the NHL, I followed hockey passionately. We lived in Montreal at the time; and a trip to the Forum or a Saturday night watching Hockey Night in Canada was guaranteed to be time well spent. The game was about skating then -- from one end of the ice to the other. And I knew the names and the reputations of everyone of the players on everyone of the six teams. The game was not without fisticuffs, even then. I was in the Forum the night Lou Fontinado, a tough defenseman who had previously played for the New York Rangers before coming to Montreal, broke his neck. The sound of his head hitting the ice still rings in my memory. But times and the game and the personnel have changed. The recent incident, in which Chris Simon slashed Ryan Hollweg across the face with his stick, is just the latest in a string of examples which illustrate that the game has become a contest between bullies. It is no longer about outskating and outscoring your opponents. It is about pulverizing them. Speedskating is about what hockey used to be about -- skating. It is fast and smooth and inclusive. There is poetry in the long strides, the low profiles and the sharp angles as skaters come around the turns. And there is the speed -- blinding, heart pumping, rhythmic speed. Moreover, there is a place for everyone. The club our son belongs to started out as an activity for Special Olympics folks and it expanded to include kids as young as three and adults well into their sixties. They compete according to their age and ability and everyone finishes the race -- no matter how long it takes. The sport is not injury free. My wife is currently nursing a broken arm, which occurred at a practice some seven weeks ago. Obviously, she and we wish that it never happened. And friends and family scratch their heads and wonder why someone her age would contemplate participating in what, to them, seems such an extreme sport. But my wife likes to see her times improve; and she likes the head space in which speedskaters live. Even as she comes around the corner -- in last place -- her teammates, young and old -- as well as her competitors -- cheer her on. Our son sets goals for himself -- to shave so many seconds off a race of so many meters; or to achieve a time which will allow him to compete at a particular meet. The path to success in speedskating is the same as the path to success in life. If visitors, who had never been to this country, asked me to tell them what Canada is like, I would take them to a speedskating competition. Like most Canadians, they would have the experience of sitting in a rink at an ungodly hour. But they would see what is best about Canada; and they would see why some of us call it The Peaceable Kingdom. 1.Median annual earnings for Canadians in the bottom ten percent of the income scale decreased in inflation adjusted dollars from $3358 in 1976 to $1050 in 2004. 2. Forty percent of Canadians -- those earning $50,000 or less -- are worse off now than in the 1970's, even though they are working longer hours. 3. Canadians earning between $50,000 and $85,000 have seen their inflation adjusted income rise two percent during the last twenty-eight years. 4. The top ten percent of Canadian families -- those earning more than $166,000 a year -- have seen their inflation adjusted earnings rise thirty percent in the last twenty-eight years. And they are putting in five percent less time at work than they did in the 1970's. Yalnizyan's conclusions were immediately attacked by conservative columnists because they were narrowly focused on Canadian families who were raising children under eighteen years of age. Andrew Coyne, of the National Post, fumed that the study contained, "a great deal of selective emphasis and statistical jiggery pokery." He claimed that while median family incomes "slid sideways" over the last twenty-eight years, they "are nearly 20% higher, after inflation, than they were a decade ago." He also suggested that low incomes in families with children is at least partly attributable to the rise in single parent families -- which have increased from 8% in 1976 to 18% today. One parent -- without a doubt -- brings in less money than two. Writing in the Globe and Mail, John Ibbitson dismissed thr work of most Canadian think tanks as "a waste of time." Then Ibbitson predicted that "[g]overnments that took this report at its word would increase upper income taxes, raise the minimum wage, bolster union rights and increase subsidies to manufacturers." Such policies, he claimed, would be "an invitation to disaster." After all, they were all tried in the 1970's; and everyone knows that they failed badly then. Or did they? Conservative thinkers tend to hold governments responsible for the economic woes of the 1970's, forgetting that the Arab Israeli War of 1967 changed world economics much more than the economic prescriptions of Milton Friedman ever did. We are still suffering the effects of that convenient amnesia. Ibbitson ignores completely the oil price shock of the 1970's, when oil went from a dollar and a half a barrel to thirty-four dollars a barrel (see my post for November 20th). Before the formation of OPEC and the price distortions it engendered in world economies, one can argue that the very policies Ibbitson disparages were the kinds of investments in human capital that made Canada one of the most competitive economies in the world. Perhaps the real problem has been our refusal to ween ourselves from what until now has been the lifeblood of western economies -- oil. However that may be, even Ibbitson admits that for the bottom half of Canadians "income levels have been flat for a generation." And it's that great divide between the top half and the bottom half of the Canadian population that should concern us -- simply because such a divide is not sustainable. It cannot be sustained because those at the top of the pyramid rely on those at the bottom to generate their incomes. The bottom half still consume the goods and services which increase the incomes of the wealthy. Henry Ford recognized this fact when he increased the salaries of his workers to the unheard of sum of five dollars a day, knowing that they were the people who would buy his Model T's. For, however true Coyne's and Ibbitson's criticisms of economic policies in the 1970's may be, the issue is still how fairly we are dividing the economic pie. It is true that Yalnizyan's study ignores Canadians who do not have, or who have already launched, their children into the world. But she also ignores investment income which, for the most part, accrues to the richest Canadians. As Tom Walkom points out in the Toronto Star, "the richest 20 percent of Canadians own 75 percent of the nation's wealth." Moreover, "we allow the country's 100 top chief executive officers to make, on average, 240 times more than the typical worker (up from 106 times the average wage in 1998)"
The Canadian Centre for Policy Alternatives makes no secret of its left of centre politics. What it does make clear is that governments of all stripes -- Conservative, Liberal and New Democratic -- have been following right of centre policies for a generation. The consequences of those policies are now undeniable. It's time for the pendulum to swing back to the left.